A couple of weeks ago, Jessica Cosmetics posted this collection on their Facebook page. Maybe I was in a Spring-y mood or maybe I was intrigued by all the pink and purple, but I thought it looked so pretty. As luck would have it, when my doorbell rang a few hours later, it was my UPS man bringing these little goodies. 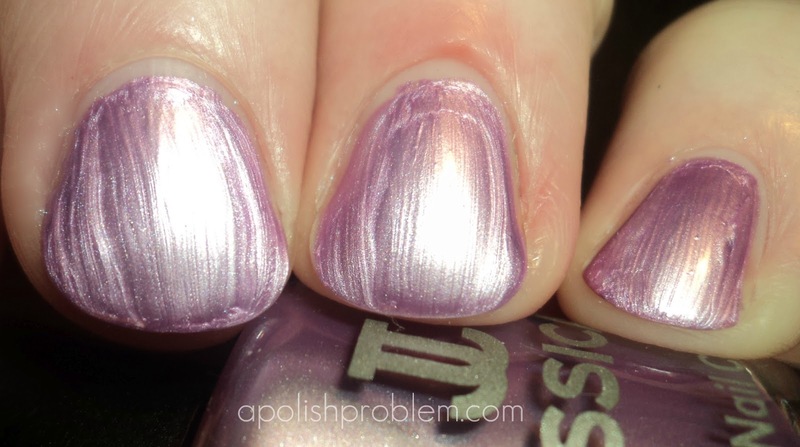 Born 2 Pansy - pale lavender with iridescent shimmer. The shimmer in this one was so pretty. Along with it's sister, Rolling Rose, I thought these 2 were the prettiest in the bottle. I was a little scared that it was going to be super-sheer, but it the formula on it was very nice. It was opaque in 3 coats. Dazed Dahlia - Berry pink. This one is the only creme in the collection, and while it's not unique, it is a pretty color with a great formula. I also liked it very much with my skintone. It was opaque in 2 coats, though it was almost a one-coater. Geranium Gypsy - light, silvery purple frost. Le sigh (and not in a good way. LOL). When I saw this one in the bottle, I was really hoping that it was a foil and not a frost. Sadly, I was wrong. The color is so pretty, and I think it may be dupish for Lippmann Purple Rain (another frosty mess that I blog-sold, so I can't compare). I really wanted to like it. I love the color and if it wasn't so brushstokey, it wouldn't be so bad, because the frost does have a foily finish to it. But, as hard as I tried, I couldn't combat the strokes. 3 coats. Hotter than Hibiscus - bright, Barbie pink frost. Like her sister, Geranium Gypsy, I was hoping in my heart of hearts that this wouldn't be a frosty mess, but no dice. Again, the color is nice, but the finish just isn't good. While Hotter than Hibiscus is less frosty than Geranium Gypsy, it doesn't have a foily-ish finish like Geranium Gypsy. 3 coats. 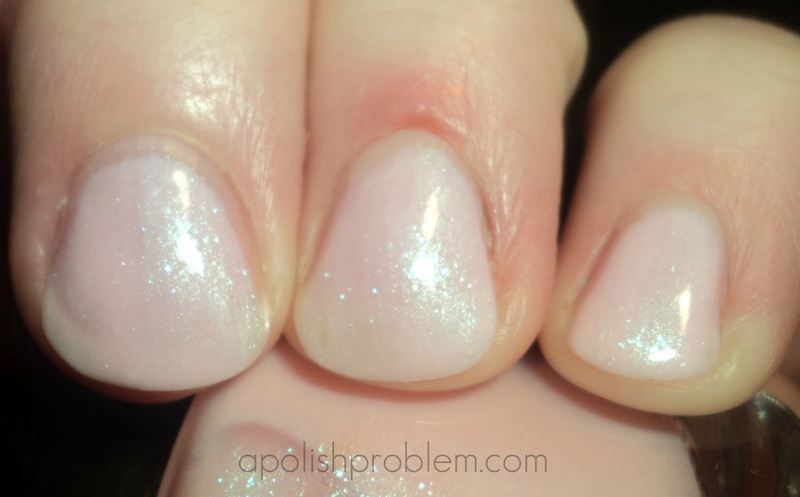 Rolling Rose - pale pink with iridescent shimmer. This one is practically identical to Born 2 Pansy, only it's a pale pink and not a lavender. 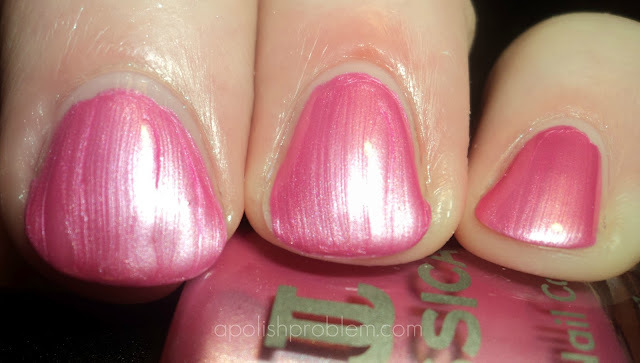 I was very happy with this one because an opaque, shimmery, pale pink is one of those colors that I am still trying to find my perfect shade. This one comes very close. The formula was great. 3 coats. Witchy Wisteria - purple with copper shimmer. In the bottle this one is so pretty, and on the nail, it didn't disappoint. 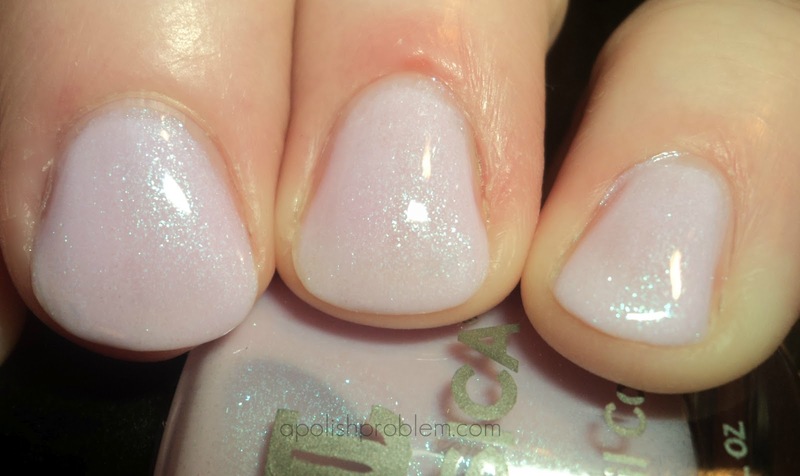 I've heard that this one is dupey to Zoya Tru, but I don't have that one to compare. That said, in my collection, it is pretty unique. To my eye, this one has a faint smokiness as well. The formula was great. 2 coats. Now that I've had a chance to review them in person, I am both impressed and unimpressed with this collection. The shimmers, Born 2 Pansy, Rolling Rose, and Witchy Wisteria are made of win. Each one is fantastic and each one is unique (unless of course you have Zoya Tru, then Witchy Wisteria isn't unique). Dazed Dahlia is a great color and if you are looking for a pink-based berry red, then you couldn't go wrong with this one because the formula is perfect. The frosts, Geranium Gypsy and Hotter than Hibiscus, are where the collection falls short. I was hoping for foils and instead, they are frosts. I just don't think frosts really work on anyone, so I would say pass on these two (though now I'm wondering about how they'd work with a Konad). This collection is available on Jessica Cosmetics' website and they retail for $7.50 a bottle. Rolling Rose looks similar to Essie Pink A Boo! Love that subtle shimmer! Witchy Wisteria also reminds me a bit of Pure Ice Purple Reign. I think this is what Purple Reign is trying to be when it grows up!